What if the person you thought you knew best turns out to be the person you never knew at all? This is the intriguing question bestselling crime writer Karin Slaughter asks of readers in her latest crime thriller, Pieces of Her. Andrea “Andy” Cooper lives an uneventful life working nights as a police dispatcher, and still living with her mother. Oliver’s mother, Laura, however is the complete opposite. She is the perfect small-town mother, living a quiet and happy life in sleepy beachside Belle Isle. She’s a pillar of the community in so many ways: a gifted speech therapist, business owner, and everybody’s friend. She has a sort of relentless kindness that is kept from being too sugary by her quick, sometimes acerbic wit. Perhaps, thought, more importantly to her daughter, Laura never keeps a secret from anyone, especially Andrea. “The air had changed. That was the only way to describe it. The fine hairs on the back of Andy’s neck stood up. A chill went down her back. Her nostrils flared. Her mouth went dry. Her eyes watered. There was a sound like a jar popping open. The handle of the coffee cup slipped from her fingers. Her eyes followed its path to the floor. While ceramic shards bounced of the tiles. In an act of incredible bravery, Laura calmly tries pleading with the gunman while simultaneously telling her daughter to run, get out of danger. Before Andrea has even time to answer, Laura goes into defensive mode, killing the attacker with his own knife. Shaking with fear and relief, Andrea can’t believe what she has just witnessed. She is simply grateful the nightmare is over, not realizing the real nightmare has just begun. Laura is quickly hailed as a hero as the media goes into a frenzy about her, hoping to build a story. However, consequences of the publicity come less than a day later, when Laura is in hospital, shot by an intruder. Why? Is this some sort of revenge killing for the man she knifed to death? The answer is not that simple or convenient. What is Laura trying to hide, if anything? As Andrea tries to find out, she must dig up her mother’s past, a past filled with blood, death, and a few skeletons in the cupboard. She soon discovers that her perfect, gentle mother was anything but perfect—or gentle. 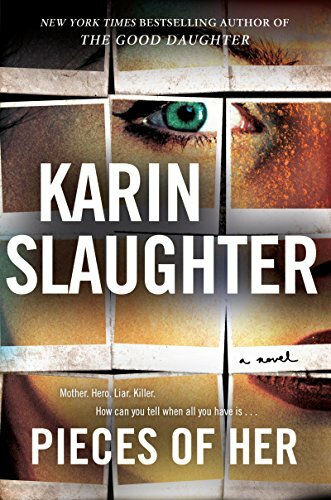 Karin Slaughter is in top form with her latest tome, Pieces of Her. She has created a nerve-shredding psychological thriller that will keep readers guessing to the very last page.